When Georg Friedrich Händel’s Arminio was premièred in London on 12 January 1737, with alto castrato Domenico Annibali in the title rôle, soprano Anna Maria Strada del Pò as Tusnelda, and soprano castrato Gioacchino Conti as Sigismondo, the remaining days of the composer’s career as a purveyor of Italian opera were numbered. The growing popularity of satirical, vaudevillian works in the manner of The Beggar’s Opera, as well as his own English oratorios, combined with decreasing tolerances for singers’ and audiences’ capriciousness and the endless responsibilities of managing operatic enterprises to sour opera in Händel’s esteem. A product of a burst of operatic creativity that also yielded Giustino and Berenice, Arminio is one of its composers tautest scores, musically and dramatically, the skill with which the characters’ emotions are given musical expression exceptional even for Händel. Having created an opera of such quality, Händel’s increasing frustration with the musical fickleness of his adopted countrymen is understandable. What is less easily comprehended is why, in this era of interest in every niche of Händel’s output for the stage, Arminio has waited so long for its sole commercial recording, an engaging performance with the late Alan Curtis leading the Arminio, Tusnelda, and Sigismondo of Vivica Genaux, Geraldine McGreevy, and Dominique Labelle, to be joined in the discography by a competitive alternative. 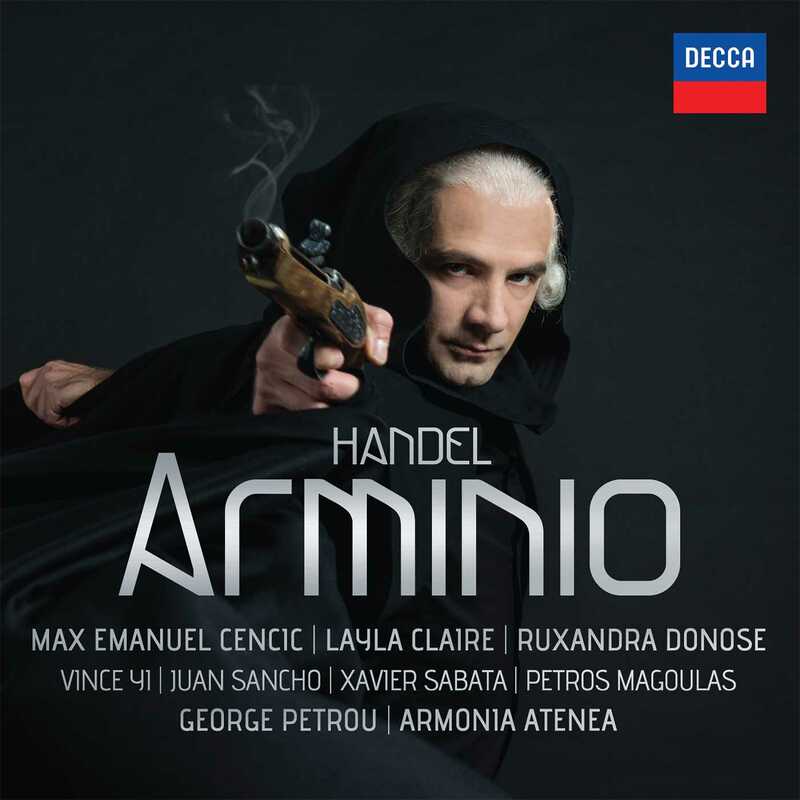 With the gender paradigms of the rôles composed for castrati reversed, DECCA’s new studio recording of Arminio is more than just a welcome alternative to the Curtis set. Few claims in the realm of Baroque music are more provocative than assertions of faithfully restoring to any of Händel’s large-scale theatrical compositions a full measure of authenticity, this being a commodity for which there is no reliable, universally-accepted gauge, but this Arminio provides a carefully-judged performance which the demanding Meister from Halle would surely endorse with enthusiasm and gratitude. A number of recent DECCA recordings of Baroque repertory have benefited from the playing of Armonia Atenea and the conducting of George Petrou, but their work in this Arminio sets new standards for performances of Händel’s operas. Bolstered by the basso continuo ensemble of Markelos Chryssikos and Petrou on harpsichord, Theodoros Kitsos on theorbo, Iason Ioannou on cello, and Dimitris Tigkas on double bass, the orchestra’s efforts serve as a catalyst to the opera’s drama, not just an accompaniment. Concertmaster Sergiu Nastasa leads the strings in a whirring, invigorating performance that honors the best elements of historically-informed performance practices without compromising listeners’ enjoyment with the acerbic sounds, faltering intonation, and exaggerated rhythms that constitute the worst aspects of period-appropriate methods. Capitalizing on the individually virtuosic but refreshingly tight ensemble playing of the strings and the wonderfully confident winds, Petrou paces the Allegro and Lentement of the Ouverture with fluidity that highlights Händel’s talents for orchestration and prefacing his operas with music that is considerably finer and more imaginatively conceived than similar pieces by many of his contemporaries. The elegant Menuet that launches the opera’s first scene and the tuneful Sinfonie that introduce Acts Two and Three are delivered with panache. Petrou uses Händel’s score as an atlas: each of the opera’s three acts is a journey with a clearly-defined destination. Reaching those destinations is here more enthralling than in the context of almost any other recording of any of Händel’s operas. That Händel was a master dramatist has been irrefutably confirmed in recent years by productions of Alcina, Giulio Cesare, Rodelinda, and Tamerlano spanning the spectrum from unforgettable to unsightly, and his mastery of creating vibrant portraits of characters using a musical palette is as evident in Arminio as in any of his more familiar scores. Here, his writing for Segeste, Prince of the Chatti, provides Greek bass Petros Magoulas with the raw materials with which to construct even in the compact space of the rôle’s duration a fully-rounded figure whose part in the action is credibly rendered. Magoulas voices Segeste’s aria in Act One, ‘Fiaccherò quel fiero orgoglio,’ with robust tone and aptly regal declamatory power that in a few stressful passages threatens to upset the singer’s intonation. It is to Händel’s credit that he made from librettist Antonio Salvi’s somewhat stilted words for Segeste a man of flesh and blood, and it is to Magoulas’s credit that he audibly makes Segeste’s flesh ruddy with the rich flow of his vocal plasma. The Roman Tribune Tullio roars to life in the resonant singing of Catalan countertenor Xavier Sabata, an artist whose every appearance on disc divulges new depths of his bold, charismatic musicality. Tullio’s Act One aria ‘Non deve roman petto dar all’amor ricetto’ inspires Sabata to a performance of uncontainable energy. His timbre glows with overtones that grant his diction special sharpness, and his bravura technique is, as ever, awe-inspiring. Sabata voices Tullio’s aria in Act Two, ‘Con quel sangue dipinta vedrai,’ with an unerring instinct for phrasing that exposes the heart of the text. He is uniquely qualified for enlivening music other singers are content to overlook, and his singing of Tullio heightens the character’s importance in the drama and enhances the histrionic impact of the performance as a whole. In his heroic portrayal of the Roman general Varo, Spanish tenor Juan Sancho deploys the fearlessness in both fiorature and his upper register that have come to typify his work. In the Act One aria ‘Al lume di due rai più fiero io pugnerò,’ Sancho marches through Händel’s passagework commandingly, the occasional wiriness of the voice enhancing the martial sternness of the character’s proclamations. In Act Three, Sancho dispatches ‘Mira il ciel, vedrai d’Alcide le guerriere armi’ with slancio worthy of a servant of mighty Rome, every challenge met head-on. Sancho’s vocal production can sound strenuous, especially when he seems to be forcing the extreme top of the voice, but it is a process that, while dangerous for other singers, apparently works for him. In Arminio, Sancho’s singing certainly works for Varo. Singing Sigismondo, Segeste’s son and Ramise’s beloved, countertenor Vince Yi deals handily with the challenging tessitura of music composed by Händel for Gioacchino Conti, known as Gizziello. A singer admired by fellow castrati Caffarelli and Farinelli, arguably the two most famous singers of the Eighteenth Century, Conti’s voice was appreciated for both its emotive capacities and its range, which in Händel’s parts for him extended to C6. A native of South Korea but a child of California, Yi is as plausible a modern stand-in for Conti as could have been engaged for this recording of Arminio, his timbre’s bright patina allied with vowel-centric, on-the-breath vocalism that is here stronger than in past performances and recordings. In Act One, Yi sings Sigismondo’s aria ‘Non son sempre vane larve’ compellingly, his demeanor convincingly masculine and the increased solidity of his singing’s core giving him an edge over similarly-voiced colleagues. Yi’s singing legitimizes Händel’s decision to entrust to Sigismondo the duty of bringing down the curtain on Act One: with his galvanizing account of the aria ‘Posso morir, ma vivere,’ the countertenor verifies that he is among today’s preeminent Händel singers, the voice secure throughout the range and the technique equal to every roulade. Sigismondo’s Act Two aria ‘Quella fiamma, ch’il petto m’accende’ is one of the finest numbers in Arminio, and Yi sings it accordingly, his manner melding refinement with vocal athleticism. In Act Three, Sigismondo’s pair of arias, ‘Il sangue al cor favella’ and ‘Impara a non temer dal mio costante amor,’ are effectively contrasted by Yi’s meticulously-managed tonal shading. Nature provides an unmistakable contrast between Yi’s and Sabata’s voices, but the singers’ stylistic choices, very different but equally effective, enable Yi’s Sigismondo to be easily distinguished from Sabata’s Tullio. The object of Sigismondo’s affection (and Arminio’s sister), Ramise, is portrayed with sophistication and entrancingly cobalt-hued tones by Romanian mezzo-soprano Ruxandra Donose, a singer whose renown does not do justice to the tremendous singing of which she is capable. Marginally off her very best form, she is nonetheless a phenomenal asset to this recording of Arminio. As sung by Donose, Ramise’s Act One aria ‘Sento il cor per ogni lato circondato’ is a tour de force, the vocal line churning with the lady’s emotion and drawing from the mezzo-soprano an effusion of glamorous sound, steady and consistent in quality across the wide range. Of similar effectiveness is Donose’s singing of ‘Niente spero, tutto credo’ in Act Two, her dramatic restraint as mesmerizing as her skyrocketing coloratura. In the Act Three duetto with Tusnelda, ‘Quando più minaccia il cielo,’ Donose touchingly limns Ramise’s emotional response to her predicament, her voice shimmering with a theretofore-unheard determination. The electric atmosphere that she creates in the aria ‘Voglio seguir lo sposo’ is evidence of the breadth of Donose’s confidence in this music: whereas many singers must focus their attention primarily upon getting the notes right, Donose has even the most daunting passages well under control and is therefore free to search in her singing for the meanings beyond the notes. Her voice is a magnificent instrument, but her singing of Ramise here confirms anew that the voice is but one element in her vibrantly reactive musical molecule. Born in British Columbia, soprano Layla Claire brings to her portrayal of Arminio’s wife and Segeste’s daughter Tusnelda a voice touched by a purity like that of the first autumn snows in the Canadian Rockies. From the start of Tusnelda’s Act One duetto with Arminio, ‘Il fuggir, cara mia vita,’ Claire sings attractively and often ravishingly, the freshness of the sound of her upper register bringing to mind the singing of the young Arleen Augér and Helen Donath. The arias ‘Scaglian amore e sangue’ and ‘È vil segno d’un debole amore quel dolore’ provide complementary vistas of Claire’s artistic intelligence, their sentiments handled with consummate good taste and the musical difficulties sweetly cajoled into submission. In Act Two, Claire summons delightfully unexpected bile in her assured, animated singing of ‘Al furor che ti consiglia.’ Tusnelda ends Act Two with her aria ‘Rendimi il dolce sposo,’ and it is difficult to imagine Anna Maria Strada del Pò singing it more plangently than Claire sings it here, the text communicated with great passion and the melodic line traced with moving delicacy. The youthful soprano voices ‘Ho veleno, e ferro avanti’ in Act Three with unstinting dramatic fortitude, her upper register sparkling. Duetting with Ramise in ‘Quando più minaccia il cielo,’ Claire joins her voice with Donose’s organically, their phrasing almost ideally matched. The arias ‘Tra speme e timore mi palpita il core’ and ‘Va, combatti ancor da forte’ are, like those in Act One, managed insightfully. The level of assurance in fiorature is never less than first-rate but is often stellar, and intonation is virtually unassailable. In her final duetto with Arminio, ‘Ritorna nel core vezzosa,’ Claire’s Tusnelda unites with her husband in a beautiful display of bel canto. Many are the Händel heroines who would benefit from Claire’s singing, but her Tusnelda is a particularly valuable addition to the discography. Interpreting the title rôle of the proud Germanic prince Arminio, Croatian-born countertenor Max Emanuel Cenčić offers some of the best singing he has committed to disc since transitioning from a clarion-voiced male soprano to a mature countertenor with a voice of true star quality. The technical sorcery that Cenčić accomplishes in his traversal of Arminio’s music is not surprising, but it is the incisiveness and ingenuity that he invests in his depictions of the character’s emotions that mark him as an artist of particular importance. When hearing performances of Händel’s music for alto castrati by the preeminent Händel singers of past generations, male and female, the bravura singing is often rousing, but rarely have singers of any era brought to Baroque repertory the finesse and imagination that Cenčić devotes to the music that he sings, not least in Arminio. From his first notes and words in Arminio’s Act One duetto with Tusnelda, ‘Il fuggir, cara mia vita,’ delivered with nobility and focused tone in the lower register that resembles the plangent timbre of a bassett clarinet, Cenčić brings to mind the Angelica of Victoria de los Ángeles in the now-dated Scimone recording of Vivaldi’s Orlando furioso. Cenčić’s singing is a model of Händelian style, of course, but he shares with de los Ángeles a dedication to portraying a character to whose plight listeners will respond rather than crafting an aural pedagogy. The sheer dramatic force of his performance of ‘Al par della mia sorte è forte questo cor’ is riveting. Dominating Act Two as he ought to do, Cenčić’s Arminio lays his soul bare in the aria ‘Duri lacci, voi non siete per me rei di crudeltà,’ the singer’s invigorating vocalism seconded by an actor’s intuitive use of text. He sings ‘Sì, cadrò, ma sorgerà’ with unforced fervor, and his traversal of the exquisitely-written ‘Vado a morir, vi lascio la pace ch’ho nel cor’ throbs with emotion expressed through song. Cenčić catapults into Act Three with a fiery reading of the accompagnato ‘Fier teatro di morte!’ He follows this with an account of the aria ‘Ritorno alle ritorte’ that radiates familiarity with and love for Händel’s vocal idiom, qualities as audible in his singing as his impeccable training and experience. In both the aria ‘Fatto scorta al sentier della gloria’ and the duetto with Tusnelda, ‘Risplende nell’alma amante,’ Cenčić sings superbly whilst also characterizing with laudable specificity. His dexterity remains a marvel, but what distinguishes Cenčić from his countertenor colleagues is the calibre of the voice. Many countertenors sing opera, but Cenčić is a rare countertenor who is a true opera singer in the tradition of Farinelli, Malibran, Pasta, Flagstad, and Callas. His Arminio on these discs is a performance worthy of the tradition of Farinelli’s Artaserse, Malibran’s Maria Stuarda, Pasta’s Norma, Flagstad’s Isolde, and Callas’s Violetta. Modern technology has in some ways made the recording of opera a far easier undertaking than it was in bygone years, but there are also drawbacks, not the least significant of which is a loss of the unique continuity possible with assembling a group of artists and recording in long takes that, in terms of personal interaction, replicated the excitement of the stage. The performance that the closing chorus, ‘A capir tante dolcezze troppo angusto è ’l nostro cor,’ receives on this recording perfectly illustrates the collaboration that gives this Arminio much of its charisma. The singers truly perform the opera: in recitatives, here rendered as engagingly as on any recording of a Baroque opera, they seem to listen to one another, something that too few singers bother to do even in staged performances. Whether the music being sung is by Händel or Henze, opera is a team sport. With Max Emanuel Cenčić and George Petrou as its co-captains and a team of all-stars playing all positions, this Arminio never misses an opportunity to score.